Generally, when people think about economic growth, they think in terms of big ideas: workforce development, increasing exports, foreign-direct investment. Most people don’t think about sewer systems or roads – the hard infrastructure that enables communities to achieve those big idea goals. The critical infrastructure that are the building blocks to economic growth are a major focus for the Economic Development Administration (EDA), and I was fortunate to be able to announce EDA grants for such projects in Massachusetts this week. On Tuesday, I traveled to Worcester, Massachusetts to announce a $1 million grant to New Garden Park, Inc. with Congressman Jim McGovern. The money will be used to create more than 15,000 square feet of incubator space to establish the Worcester Technology and Idea Exchange in the former Worcester Telegram & Gazette facility. 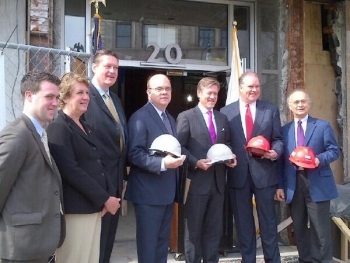 This is an investment for the future, an investment that is critical to the continued revitalization of Worcester’s downtown business district. According to grantee estimates, the planned technology incubator and accelerator will create more than 100 jobs by supporting a central location for entrepreneurs to explore and start a business in growing industries. Following that announcement, I visited Devens to announce a $1.85 million grant to the Massachusetts Development Finance Agency of Boston. This grant will support the final phase of the Jackson Road reconstruction project at the Devens Industrial Park. In today’s global economy, first-class jobs gravitate to first-class infrastructure. The improvements will enable two manufacturing firms to expand their operations and attract private investment from automotive and film/video production businesses. The EDA investment is expected to generate $307 million in private investment and create 460 jobs, according to grantee estimates. Finally, I traveled to New Bedford to announce a $200,000 grant to the New Bedford Economic Development Council, Inc., in New Bedford, Massachusetts. The grant will support the creation of an advanced port development and redevelopment plan that will guide the city as it works to attract new types of manufacturing and jobs associated with wind power infrastructure, commercial fishing, and tourism. At EDA, all of the work that we do is designed to do achieve four key objectives: leverage scarce resources, drive greater impact for job creation and economic growth, attain a better return on the taxpayer dollar, and make applying for federal resources a more seamless process to. Infrastructure and planning matter. They are the little things that make the big ideas come to fruition. EDA’s investments in Massachusetts will provide a solid foundation for economic growth in the region.